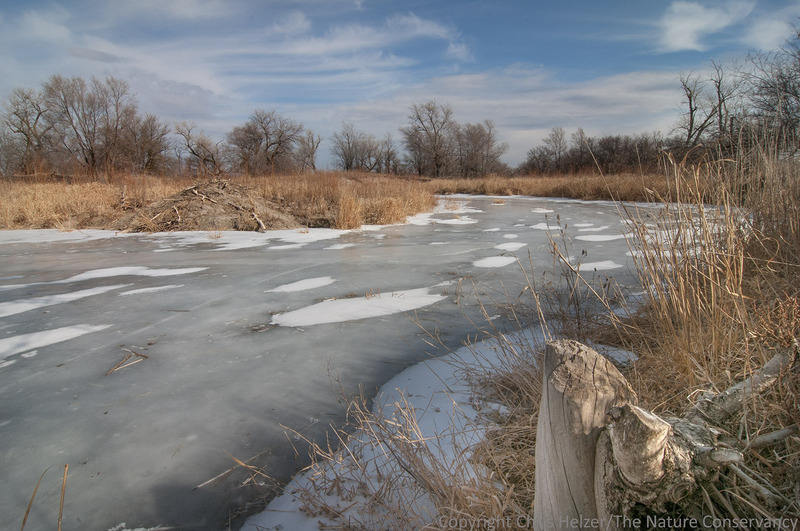 As I posted a couple days ago, I spent some time at my favorite wetland earlier this week. It was a cold, but very pleasant morning. The sun was moving in and out of thin clouds, creating attractive light and a nice sky for photograph backgrounds. 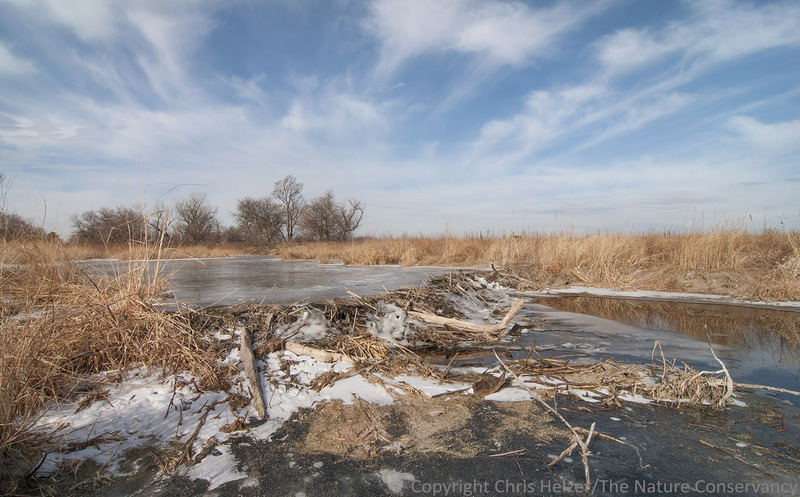 A beautiful early March day at The Nature Conservancy’s Derr Wetland. 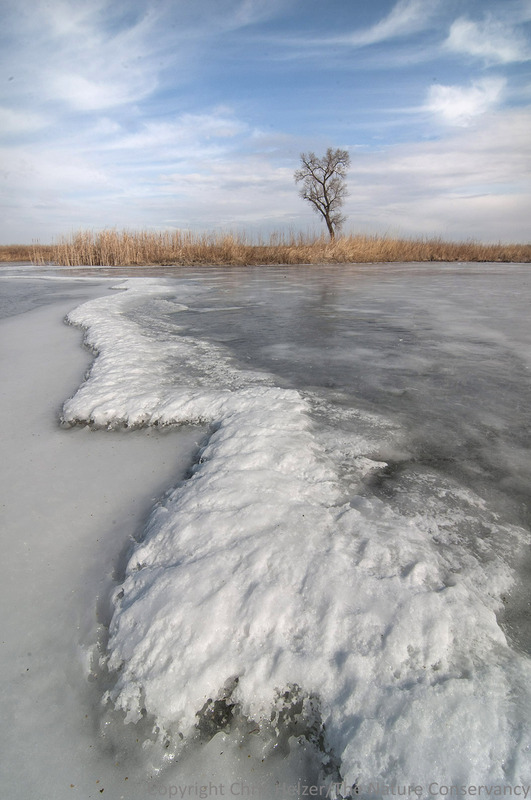 An ice ridge formed along the edge of a flowing channel prior to the most recent cold spell. It apparently caught blowing snow during last weekend’s flurries. 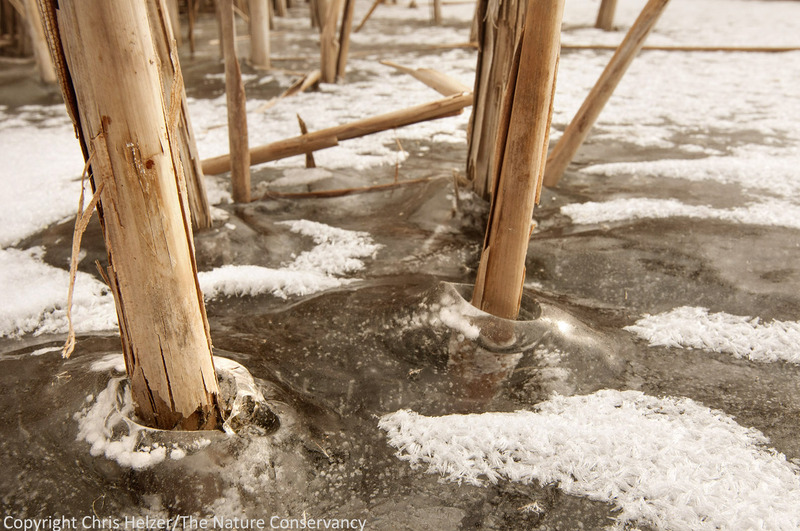 I assume the gap near the bases of these cattails was formed either by wind or by the relative warmth of the cattail stems, but I can’t explain the mounded ice. Beaver activity was obvious along the stream that runs into and through the wetland. Numerous dams are being maintained, and I found lots of recent tracks and marks from the dragging of sticks in patches of snow or bare sand. 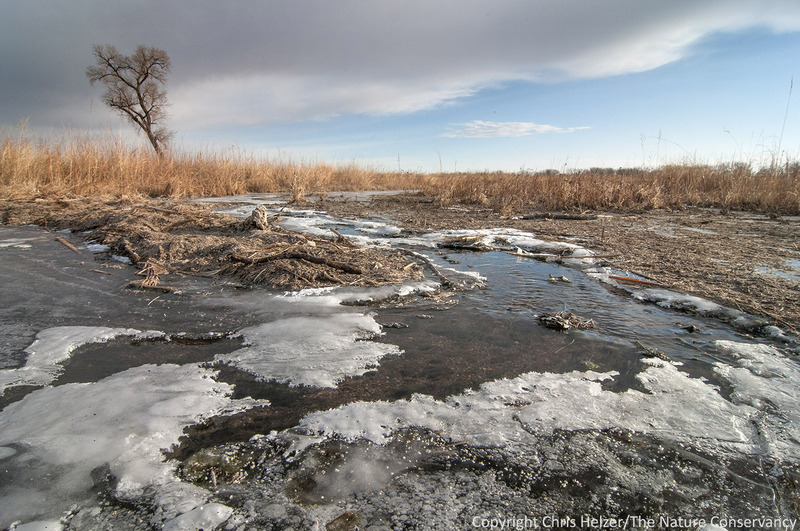 The beavers’ slowing of the streamflow probably enables the surface to freeze more quickly – to the detriment of waterfowl looking for a place to roost and feed – but the concentrated flow through the dams maintains small areas of open water where wildlife can access it. Water pours over a small beaver dam. 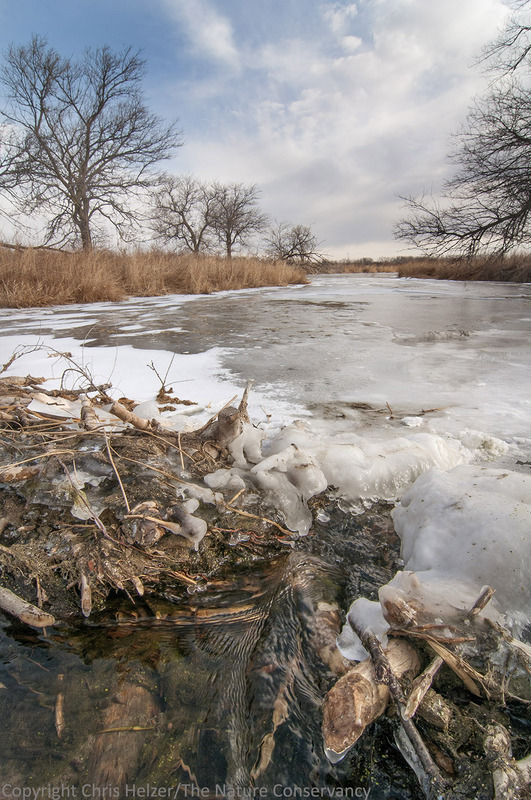 The only open water left after the most recent cold snap was just below some of the larger beaver dams, though the ice was very thin in other places, especially above some of the more active springs. Water flows through the spillway of a dam just upstream of the open wetland area. 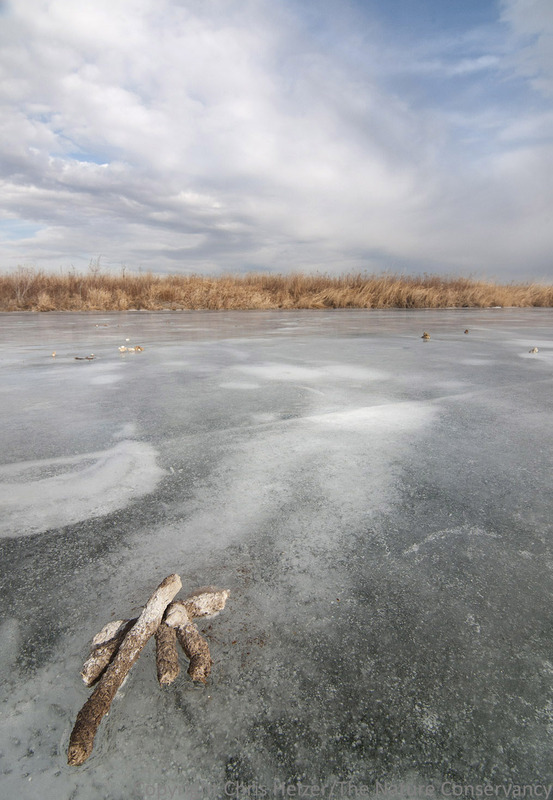 There are at least seven separate dams being maintained by the inhabitants of a single beaver lodge. The beaver lodge is several hundred yards upstream of the main wetland area. 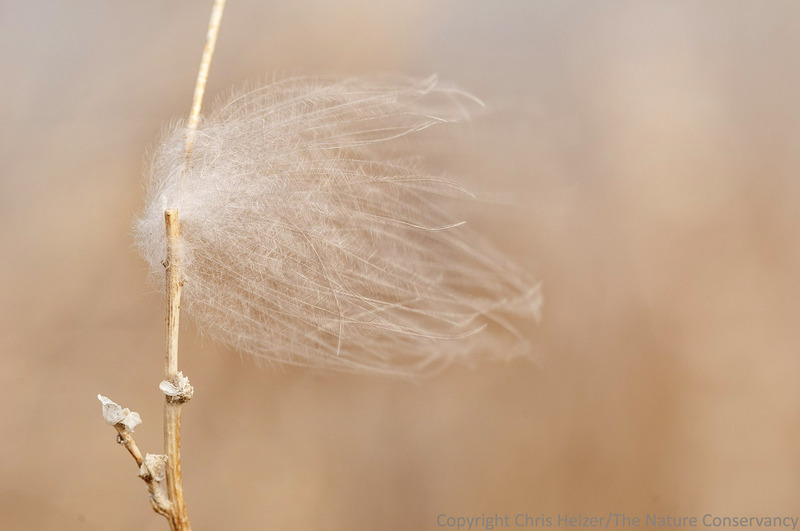 Here and there, tiny fluffs of feather clung to plants of all kinds. 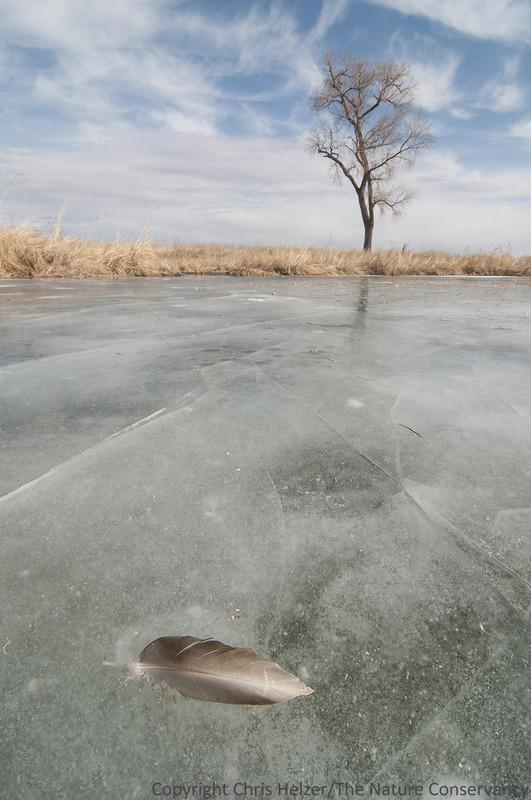 Feathers were not the only thing geese left behind on the ice. I can’t think of a better way to end this blog post then with a big pile of goose poop. So there you go. No beavers or geese were harmed during the making of this blog post. However, more than 300 images were shot during a two hour period. 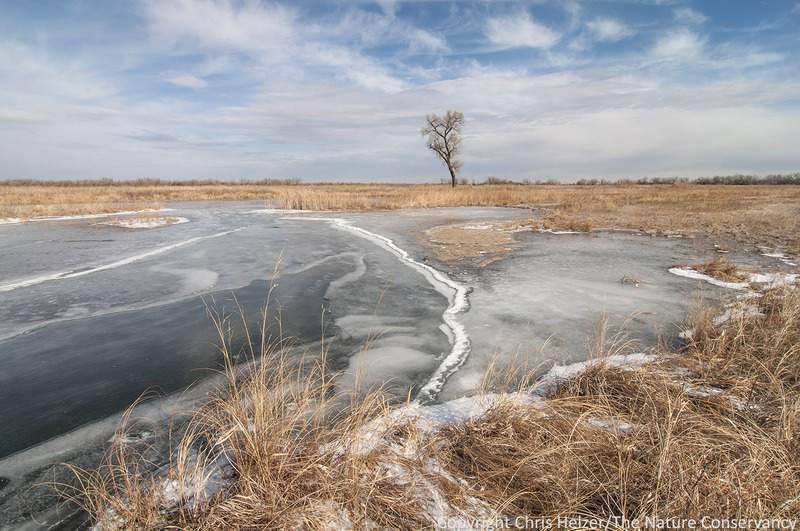 This entry was posted in Prairie Animals, Prairie Natural History, Prairie Photography and tagged beaver, beaver dam, derr wetland, feather, frost, frozen, ice, nature photography, nebraska, outdoor photography, photography, platte river, the nature conservancy, wetland restoration, winter by Chris Helzer. Bookmark the permalink. Is there ever a time of day or year when the prairie is not beautiful? Thanks again Chris for reminding us of that through you photographs. Haha! Love your closing statement. I’ll hazard a guess on the mounded ice around the catttails: perhaps snow pasted to catttails melted or fell off and accumulated around the base? Nice images Chris. I was able to get some pics of the mounds of ice/snow/sand along Lake Michigan this winter. Some really cool stuff. I’d share but I don’t see an image icon on this box. I think I know what is happening with the cattails. That was a challenging one. Such beauty is in the little details you’ve images! And in the big picture department, it’s really a wonder there’s enough winter food (bark-covered woody stems) to sustain beavers at this site.